Did you hear the CHEERS, HOOTS, & HOLLERS? A milestone has been reached! The Fashion Show for Cancer Luncheon tickets are SOLD OUT! What a wonderful kick off for a worthy cause. The stage is set for a lovely fashion show, a variety of raffle basket drawings, an exciting silent auction event, and the 50/50 raffle lottery (you do not need to be present). Doors will open for browsing and no-host bar at 10:30 a.m. Program will begin 11:45. There is a waiting list if you haven’t yet purchased a ticket. Also, the event Chairs have assured us that anyone is welcome to participate in the silent auction and 50/50 raffle drawing. Just mosey down to the Madera Clubhouse on February 25th at 10:30. More details will unfold as we get closer to the event. Speaking of 50/50 raffle tickets, they will be on sale beginning at 9 a.m. on January 28. All proceeds go to the American Cancer Society. The winner will get at least $605. Winning name will be drawn on February 25. Again, no need to be present to win. Polo shirts ($20) and green visors ($5) with the club’s Quail logo will be on sale at Monday morning’s program. Please stop by the table at the back of the ballroom to inquire on availability of shirt sizes and colors. Join us, Monday morning, January 28 at 10:00 in the Madera Ballroom as we welcome Krista Millay, Community Director of the Women’s Foundation of Southern Arizona. Krista will share information on the issues faced by single mothers and other women in Southern Arizona. In addition, she will present information about the Foundation and results of the latest research into the life and needs of women in our area. The program is guaranteed to be informative, interesting and thought provoking. There will be ample time and opportunity for questions and answers. Additional baskets and other containers plus special items of interest are in much need for this year’s basket raffle. Completed baskets are welcomed. Please contact Pam Rodgers at prodgersaz@gmail.com or 561-7969 to donate. TWOQC Fashion Committee is calling upon members to provide items for the Silent Auction. This year’s plan is to highlight unique opportunities, including those listed below, and we welcome your additional ideas. Please contact Diane Gordon by email at: bydandcolorado@comcast.net to donate. Remember, donations are tax deductible as proceeds directly support the American Cancer Society. Donations receipts will be provided upon request. Thank you for your generous support of this event. Don’t put away your holiday party clothes just yet! Pick out some bling to wear and come join us on March 18th from 3:00 to 5:00 p.m. at the Madera Clubhouse. If you don’t have bling come in comfortable attire! We are celebrating fifteen years of TWOQC with a Monte Carlo casino theme. The party will start with a toast to the club and all our accomplishments. There will be games of chance, great hor d‘oeuvres, a cash bar, prizes to the top winners and plenty of opportunities to visit with members. No formal program – just lots of fun. Tickets are available by visiting our website at womenqc.com and clicking on the “hand of cards” in the right margin or you may purchase in person at our program Monday morning. Do you see a beautiful lady with a pink name tag? She is one of our new members! Please introduce yourself and invite her to sit with you at Monday’s program. Since September we’ve welcomed 60 new friends to TWOQC. Making new friends is what Quail Creek is all about and is especially dear to us as The Women of Quail Creek. We are all the ambassadors of our warm and welcoming club as well as our community. Your hospitality and kindness leaves a lasting impression with all our members and guests. Welcome to our newest members: Carole Ann Fougere, Pat Holmes, Dorothy Lehmkuhl. We are so happy to have you join us! On Monday, March 4, Brian Vikander will share his experiences as a National Geographic Photographer. The lecture will take place in the Madera Clubhouse Ballroom at 7 p.m. and is open to all Quail Creek and local residents. The lecture is co-sponsored by TWOQC Scholarship Committee and the Quail Creek Education Committee. Tickets are $5 by check at the Concierge Desk or check/cash at the door. Tickets will be available before TWOQC January 28th program. All proceeds benefit the scholarship fund for graduating senior girls and women in transition. The Baby Shower Committee is gearing up for the Military Families event slated for Saturday, May 18th. The excitement begins with having 8 babies so far. A donation box will be at the front door of Kathi Krieg’s house (2680 E Sawyer Road) starting January 31st. Watch upcoming Friday Morning Messages for information when a donation box will be placed in the Madera Clubhouse lobby and for a list of items needed to help fill the gift baskets. If you traveled over the holidays and brought home unopened travel sized toiletries, they will be perfect for the homeless veterans who go to the VA for a shower. Any leftover disposable utensils, plates and cups will be put to good use for walk-in clients. 2019 calendars are still needed as are puzzle books for the hospitalized veterans. Please place all items on the table at the rear of the ballroom at Monday’s program. It is time to write our notes of thanks to veterans for their service. Please begin writing notes for the veterans going to Washington DC April 23-24th. There will be 55 participating in the special flight. One letter or note will do as Kay Robinson has generously offered to make copies. Letters should be folded and sealed with one sticker each. Ideas for beginning the notes can be found HERE. 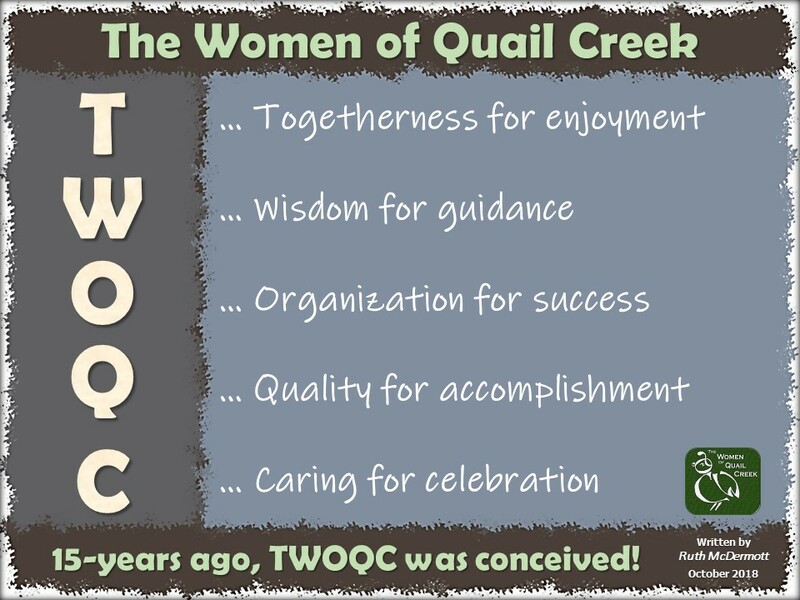 Bring your notes to The Women of Quail Creek meeting January 28th or to 898 N Kenneth Drive by April 8th. Your tribute will remind those who served that they have not been forgotten. “Thank you” to this week’s contributors: Kathe Alves, Nancy Jacobs, Lisa Johnson, Kathi Krieg, Peggy McGee, Carol Mutter, Angie Werner, Julie Woodard.